We have returned from our special place – Yellowstone. Not all of us is back. We seem to always leave a little of each of us there to soak it in, to be ready to relive it at the slightest opportunity. 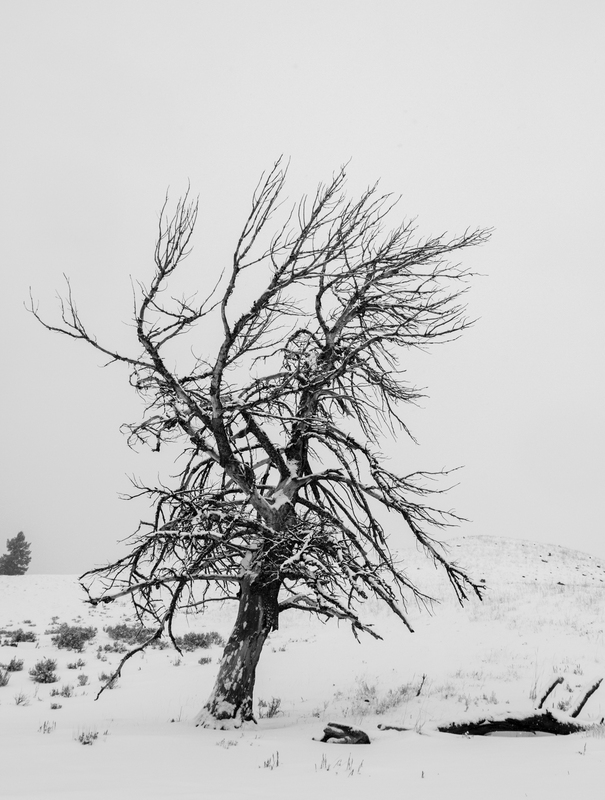 Winter in Yellowstone is truly magical and we were lucky to spend ten days in our paradise. The trip had been planned for over a year, with NC friends joining us for a while, and Melissa and I out there on our own a few days, spending some time with some of our Yellowstone friends. This is the first of a few posts on the trip, this one being the first few days before our NC friends joined us. The forecast looked snowy for most of our time, with only occasional breaks for sun. 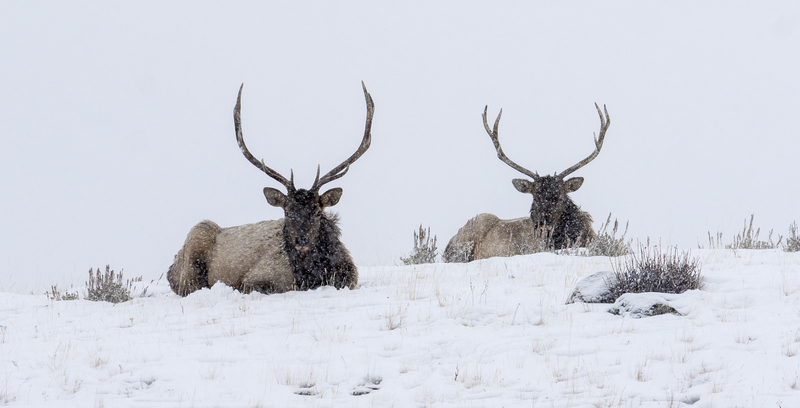 Forecasts can be iffy in Yellowstone, but this one turned out to be pretty accurate. The region needs snow, as it is only about 50% of the normal amount on the ground for this time of year in many places. Our first few days were spent traveling the Northern Range from Gardiner, MT (where our friends live) to Silver Gate and Cooke City (where other friends live). 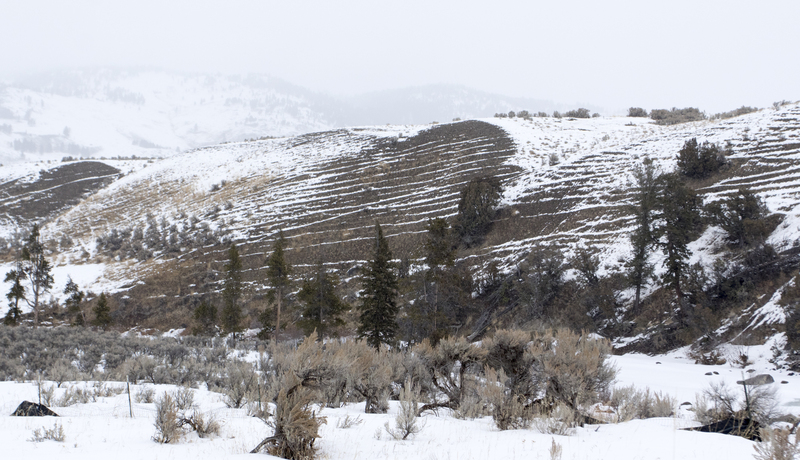 This is the only roadway open to cars in winter due to the isolated communities outside the Northeast entrance that would otherwise be cut off due to deep snows in the mountain passes to the East. 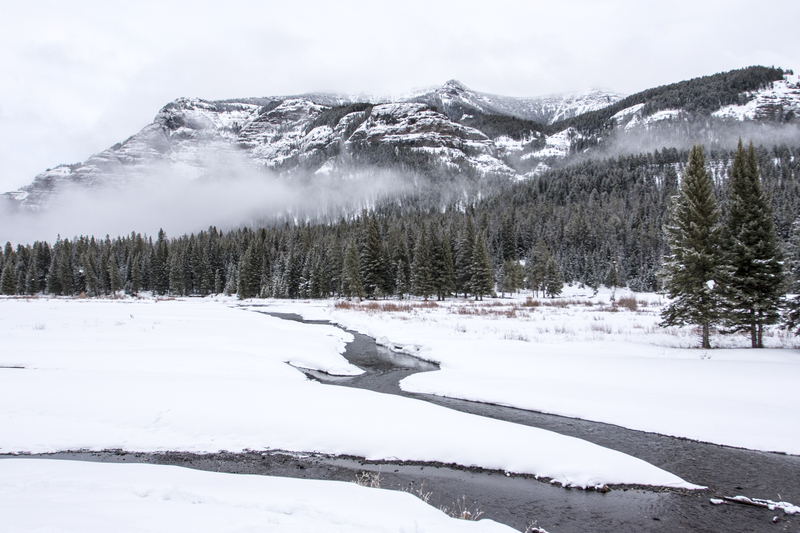 We saw the usual wildlife in the lower elevations – bison and elk – with larger herds of elk (especially cows, young bulls, and young of the year) than I have seen in a few years. As usual, we ran into a few bands of bulls peacefully hanging out together, even though they had battled fiercely for dominance just a few months ago. 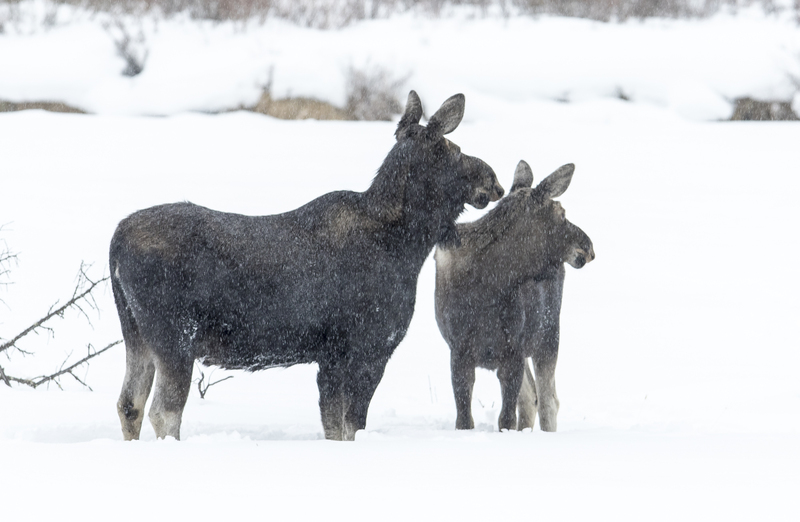 Reports online had indicated this is a good year for moose, especially in the area known as Round Prairie, out past the wildlife-rich Lamar Valley. 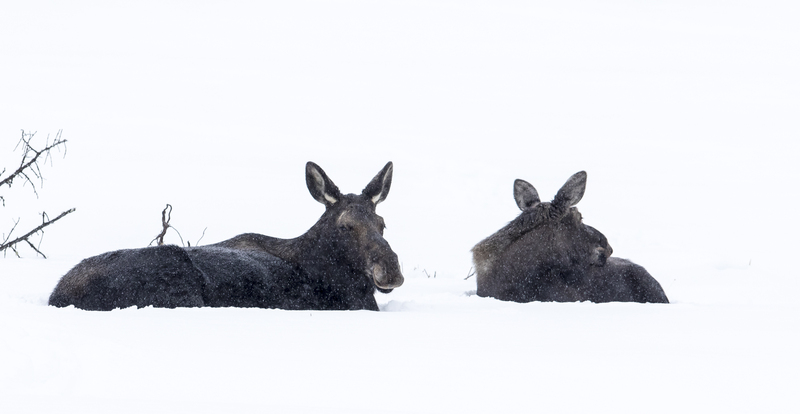 Our first full day confirmed that – a total of five moose seen on out first visit out there. Two (possibly a cow and her calf from this year) were fairly close to the road bedded down. They seemed quite at ease until a young bull sporting only one antler (it is antler shedding time for moose) passed through, seemingly intent on something in the woods beyond the resting pair. They sprang up and stared in the direction he had disappeared. We never saw the object of all their attention but they soon calmed down and moved on to browse on vegetation sticking up out of the deepening snow. We were standing along the roadside when a truck pulled up, said something about the moose out in the meadow and then mentioned, “you know you have a moose up on the hill behind you, don’t you?”. We looked behind us, and there it was, a huge moose standing along the ridge line, looking out toward Round Prairie. It was what one photographer out there called a “silver dollar moose” – a bull that has recently dropped its antlers, leaving two large circles of bone exposed on the head. 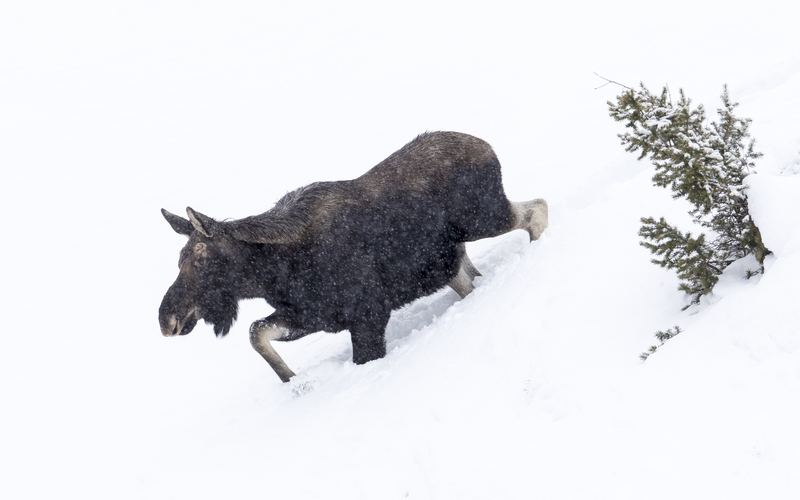 The moose quickly came down the hill, moving gracefully through the drifted snow. 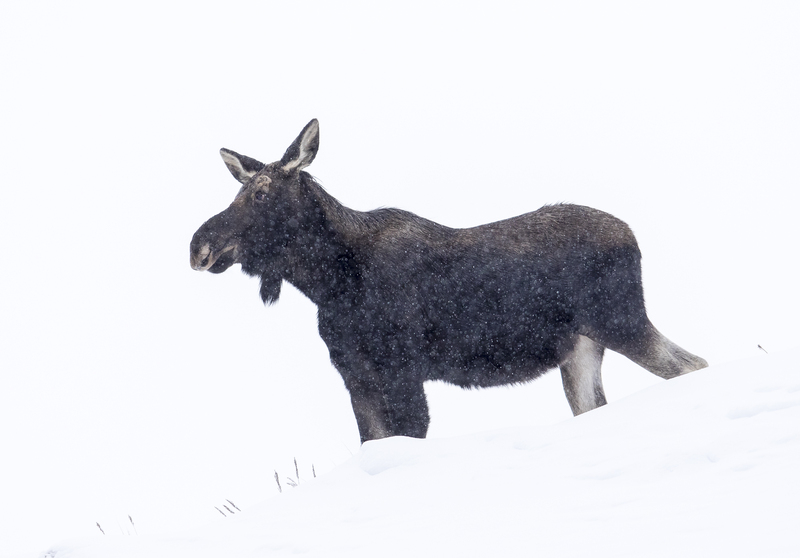 Large hooves, long legs, and a special gait (due to the ability to swing out their legs over the snow) allow moose to move through deep snow more efficiently than most ungulates (hoofed mammals). This one made its way down the hill, across the road, and into the forest in a matter of seconds. One of Melissa’s goals on this trip was to cross country ski on our first few days, so we headed up the Tower Road, a groomed ski trail. My sore leg didn’t care for that activity, so she went solo on her next two trips, with me being her shuttle and waiting for wildlife in the interim. 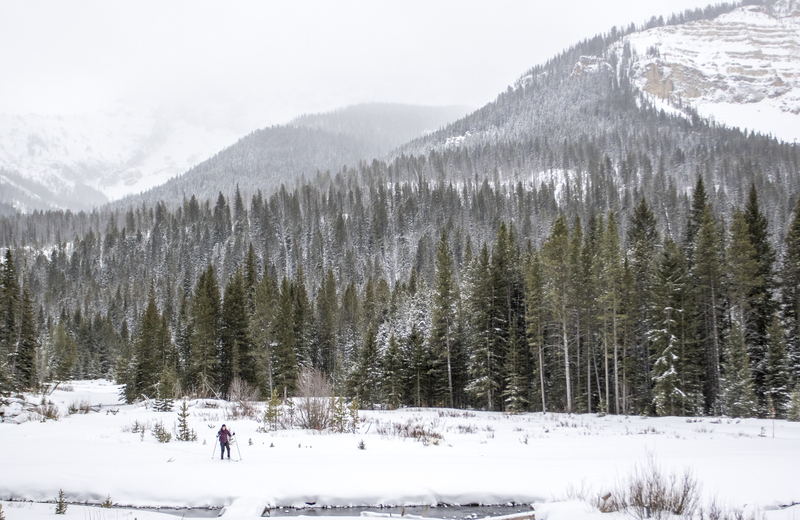 I hung out for a time at Soda Butte, where an old bull bison seemed not long for this world. 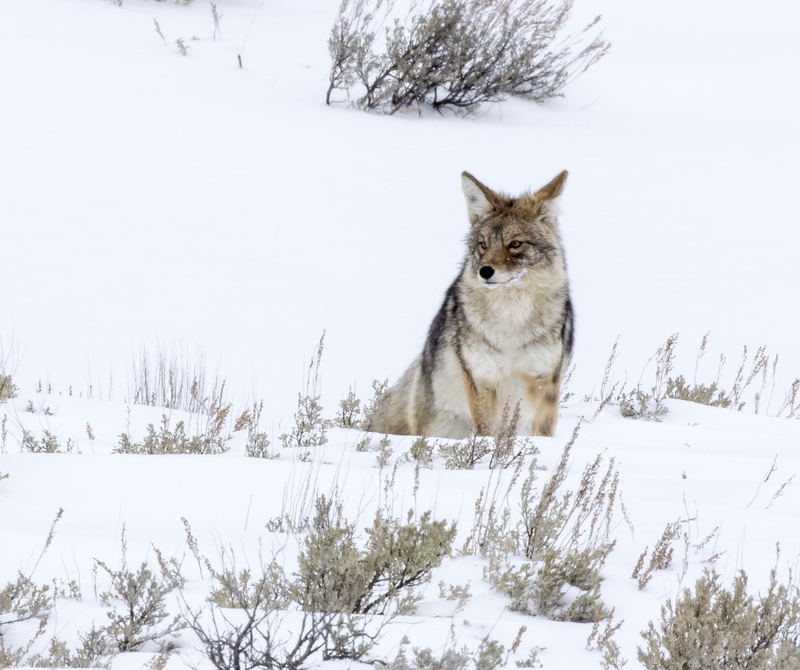 A visitor told me a coyote had been sitting with it most of the morning, waiting its turn for a possible buffet. 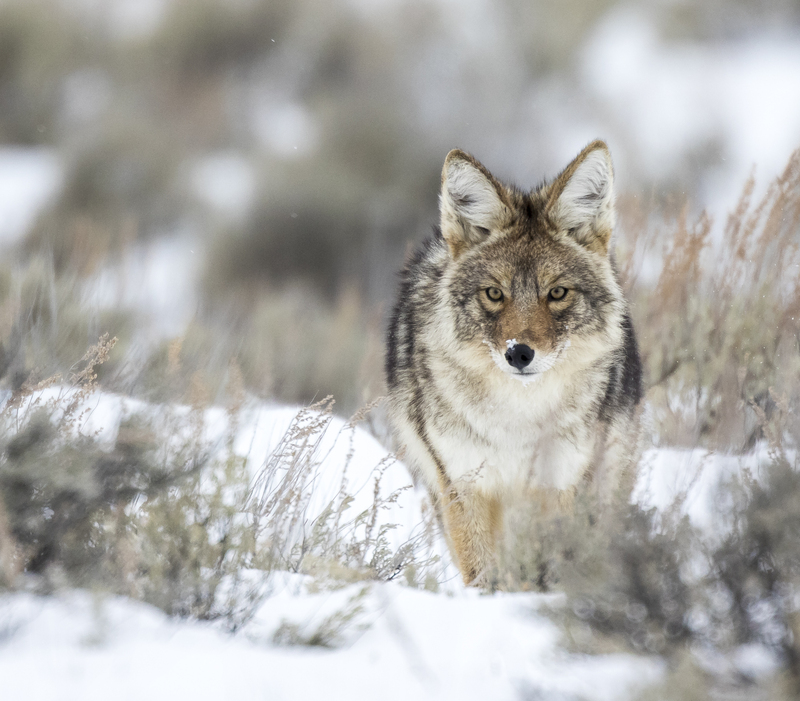 When I arrived, the coyote was across the road trying to extract a morsel form an old wolf-killed elk carcass. 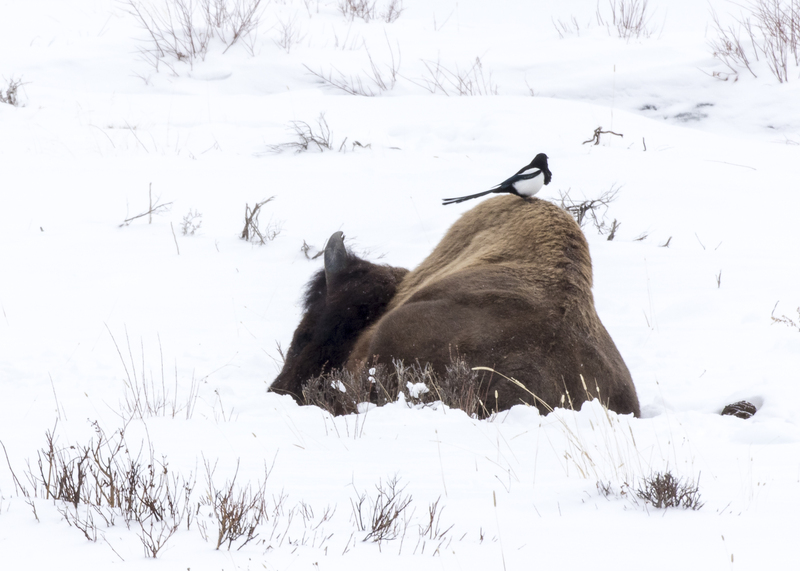 A pair of magpies kept hopping up on the old bull, wondering when they might have a chance at feeding. When one hopped on its face (they often go for the eyes on a fresh carcass), the bull shook its head to let us all know he wasn’t through quite yet. The coyote then decided to come back to the bison and check in. But, to our surprise, it chose a path that took it right past a small group of us standing at the pullout. Once across the road, it went over, checked on the bull, and then walked away, stopping to listen for unknown sounds in the snow. The first few gray days were broken only occasionally by brief bursts of sunlight. 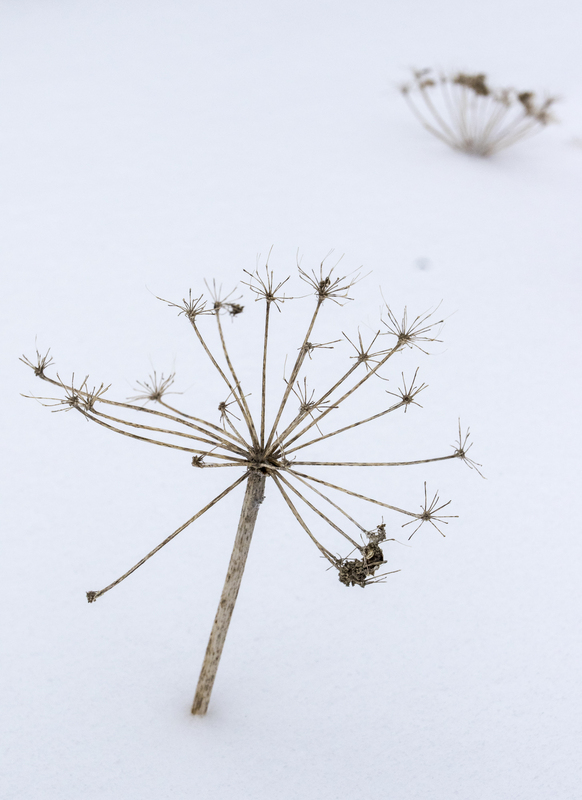 The snow fell each day, a light, fluffy snow that accumulated faster than seemed possible. 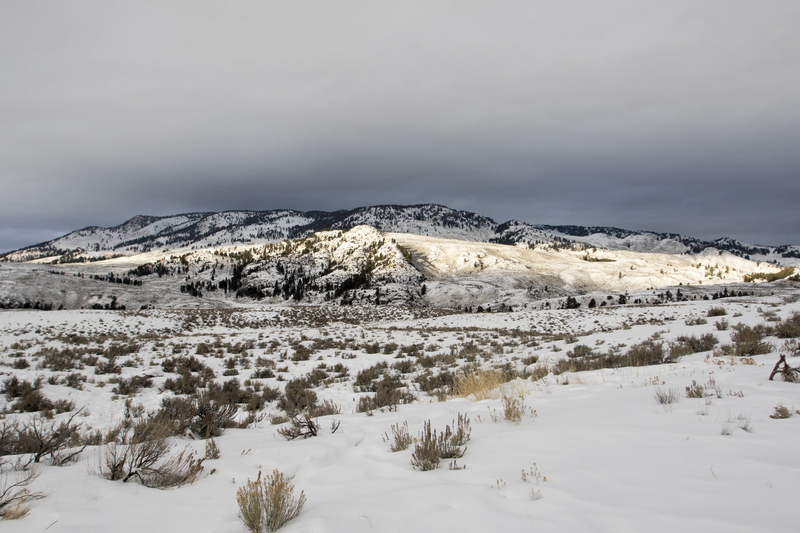 This entry was posted in Natural History, Trip report and tagged yellowstone in winter by roadsendnaturalist. Bookmark the permalink. So beautiful! Thank you for sharing your experiences with us. I look forward to seeing more. Beautiful photographs and commentary. Thank you Mike! 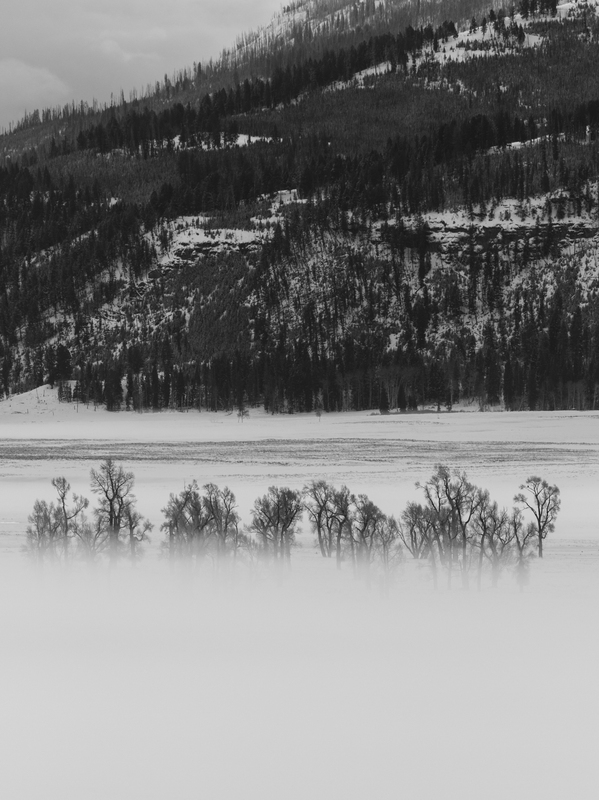 Yellowstone in winter is magical. One can hear the silence. Thank you for your photos and narrative. I am hoping to head toward the NC coast to marvel at the Tundra Swans very soon. Motivated by your blog and photos from Pungo. Thank you for the kind words, Mariana. Both of these places are indeed magical. One of my most favorite places. 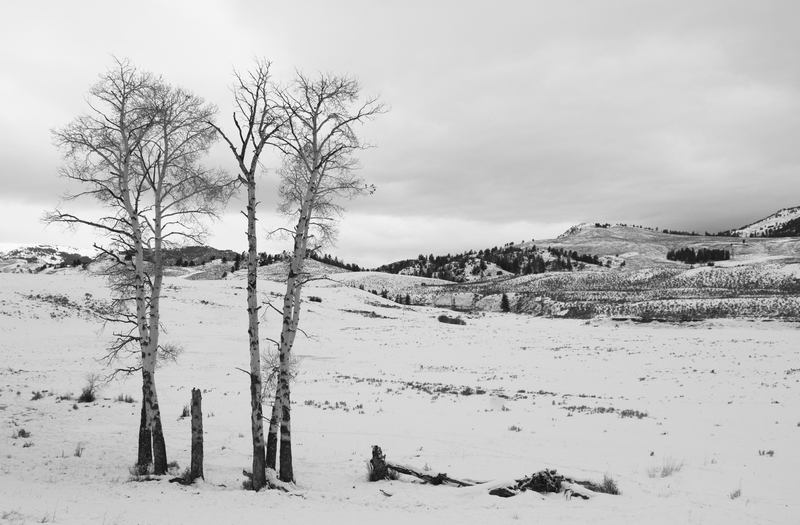 I lived in Jackson Hole one winter and that whole area sparkles in the winter. You got some wonderful winter animal pictures. Wow! wow! wow! So beautiful and magickal. Thanks for sharing. 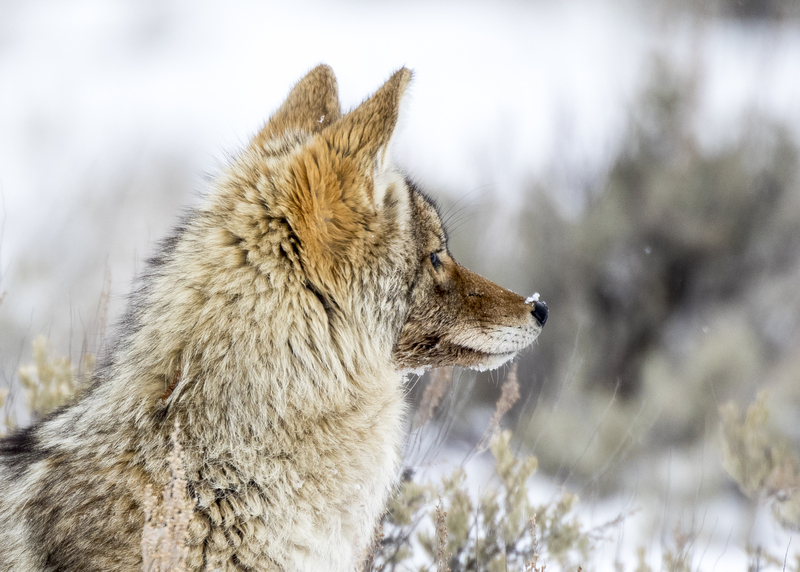 beautiful , beautiful images…loved that Coyote facing you, and the 2 elk on the ridge…just awesome work. Thanks, Mary. Still in awe of your Pygmy owl shots. What a find! Not as cold as it appears actually…dry cold is less penetrating than what we often have here in NC. Yellowstone is one of my favorite places too. You captured it beautifully. You were lucky to see moose. I heard their population is down. This has been a good year for moose. 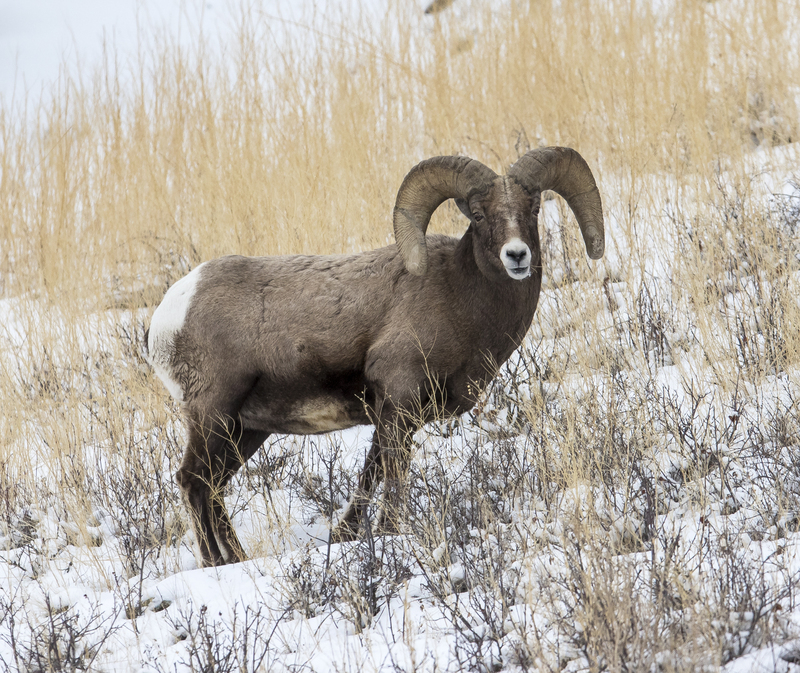 They are often one of the tougher big mammals to see, but the NE area of the park is usually pretty reliable. Yeah, we have seen them in past years but didn’t any last year in late May. There are only about 200 in the park.